Matthew's Occasional Adventures: £3400 - thank you! I've just wrapped up the fundraising for this summer, and I'm incredibly grateful to everyone for getting behind Motability and CPRE, who do fantastic work that is so close to my heart. 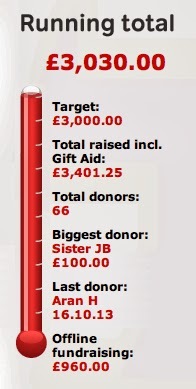 I originally thought £3000 was a crazy target, but £3030 (£3401.25 including gift aid) means each charity will receive £1700 in the next few days. I am humbled by your generosity. Thank you.